It's looking more like Spring in my house! I adore making these satin flowers found from my previous post here. They are super easy and cute. No measuring or sewing involved! Cut 3 circles small, medium, and large from satin fabric. Then burn the edges carefully to make them curl. They magically turn into flower petals. Then secure with a paper brad. That's it!!! My inspiration for the satin flowers is from Jones Design Company. I decided they would look fantastic on a wreath!! I found a dark wood frame on clearance for $6.00 from Hobby Lobby and spray painted it pink. Then I used straight pins to secure the flowers to a foam wreath form. Make sure to pin under the first flower layer so your pins don't show. This will look fab with my Easter Decor! Ya I know it's early, but I love Easter! Gasp! Your wreath is adorable! I must have missed this post on Jones. So glad that I saw it here on your blog! So very pretty!! I would be thrilled if you stopped by my Commercial Break Thursday at http://www.suzyssitcom.com and link this project! Hello! There is just something about his color combination that makes the blood rush! I love it. Great post...thanks! That is absolutely darling!!! I love it! I love your colors, and the brads are such a great easy idea. I am going to try this, only I will have to do it in pink LOL! This wreath is really beautiful, I love flowers and spring! This is lovely!! Perfect for spring. And I love it w/ that polka dot ribbon. Your wreath turned out so pretty! very cute idea... I think I am going to have to try this!!! I am not good about making time to make crafty things like this but I am needing a spring wreath and this would be perfect. This is too cute! Found you over at Tatertots and Jello, I'm your newest follower! I love this. I am looking for ideas for a spring wreath. I love the colors. Cute! I'm featuring this over at womenwhodoitall.blogspot.com tomorrow. SO cute! I'm going to have to give satin flowers a go! This wreath has the most sweet spring colors! Oh my, this is adorable! 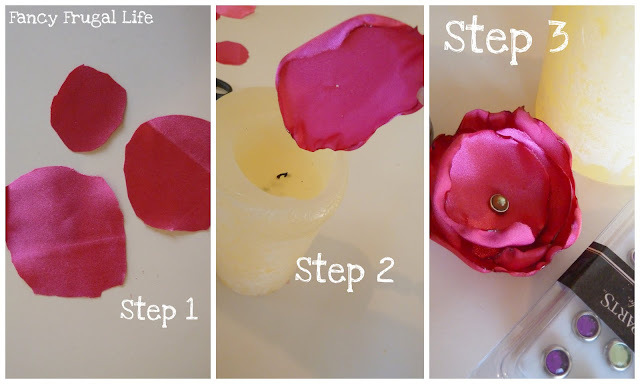 Thank you for the directions, I have always wanted to know how to make the burnt edge florals. This is adorable. You should post it on inspiredbycharm.com. He is having a spring linky contest and I'm sure this would have a good chance at winning! Love it! So cute! I'd love to have you link this up at my new Link Party! That is such a pretty and colorful wreath. Thanks so much for joining WUW last week. This is adorable! I have beautiful satin leftover from my wedding that would make gorgeous flowers. Thanks for the tutorial! love it! So happy to find a new use for those singed flowers! Thank you! 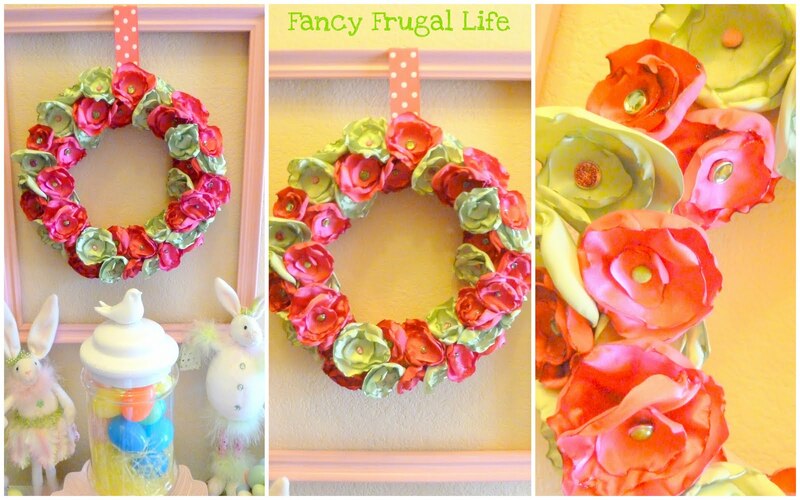 Your adorable wreath has been featured on my "Tuesday Tutorials" blog post on 3/8/11. Thanks so much for the great tutorial! Gorgeous wreath! I love making silk flowers! cute wreath.. I was wondering if you would like to be featured on my blog with tutorial about this wreath or any new idea you have not posted yet? Also introduce yourself and your blog. I will also love to add your projects as my favorites.. I just luv your wreath! I saw a tutorial on these flowers on another blog...I luv your use of them. I have since been addicted to making these beautiful little lovelies and now I know what I can do with them! This wreath is adorable!! Great job!!! 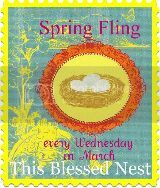 thanks again, for linking up to the SPRING FLING! Featuring this on my blog tomorrow. Love it! Stop by to check it out if you can. That wreath is just gorgeous. Thank you so much for linking up to my Swing into Spring party. The link for this week opens up tonight at 8pm EST. Hope to see you then. I am obsessed with these flowers now I have another reason to make more! Thanks! Those are really adorable...I am definitely going to make me one of those!! Love the wreath - saw it over at Centsational Girl. Enjoy your pretty Spring decor! This is awesome! I came over from Centsational Girl! Thank you for the flower tutorial. It looks so easy - I bet even a caveman could do it! Your wreath is so pretty! Love the colors that you chose. I'm a new Linky Follower. I have a party going on at Project Queen. Love it if you shared your wreath!